Chökyi Drakpa has written, “The preta realm is destitute of food and drink, creating hunger and thirst. It is a grim place of rocks and charred tree stumps, where the words ‘food,’ ‘drink’ or ‘comfort’ have never even been heard … Since these pretas do not find anything to eat or drink for months and years on end, their bodies are emaciated like skeletons and they lack even the strength to stand.” Pretas tend to dwell in wastelands, deserts, or even garbage dumps and cemeteries on earth, moving freely between our world and their hell. They sometimes feed on human corpses, human waste, or flakes of skin. Unlike the ghosts and demons of other cultures, however, pretas are generally pitied rather than feared, and Buddhist monks often leave them offerings of food or money. 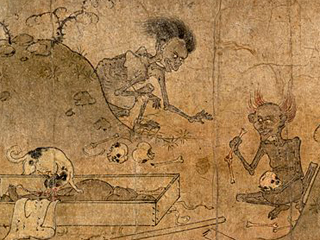 Hungry Ghosts can be divided into several categories. Those who were moderately wealthy in life are in three groups: the flaming mouths (food and drink become fire), the needle mouths (their throats are so small that food can’t pass through), and the vile mouths (whose mouths are so decomposed that they can’t eat anything). Those who were very rich also have three groups: the ghosts of sacrifices (they live off the sacrifices of the living), the ghosts of losses (who live off of lost objects from the human realm), and the ghosts of great powers (the rulers of these ghosts). And those who had no wealth are able to eat just tiny portions. 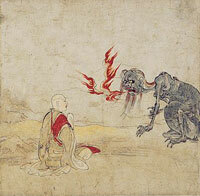 Hungry Ghosts or their like are found in Buddhist, Hindu, Taoist, Sikh, and Jain traditions as well as in Chinese traditional religion and ancestor worship (the phrase “hungry ghosts” is derived from the Chinese). They take different forms in different traditions. For instance, in Japanese Buddhism, the gaki are the spirits of greedy people that are cursed with a great hunger, and the jikininki similar spirits that feed on human corpses at night. 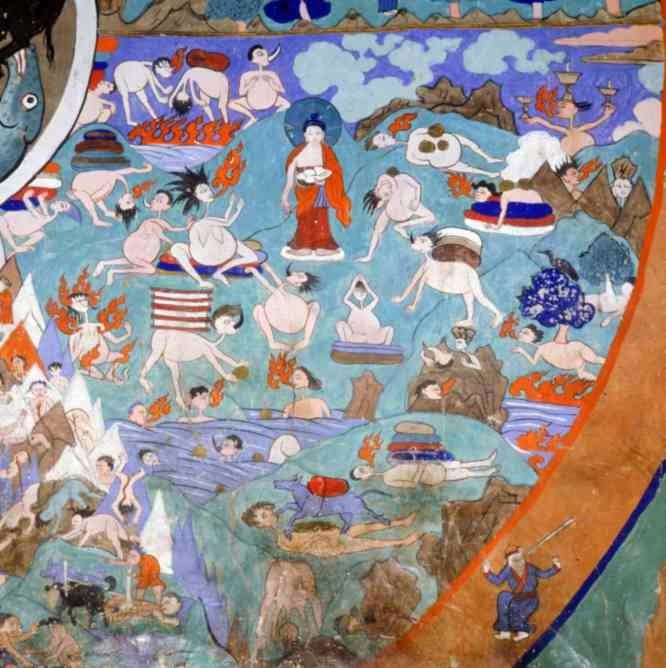 In Tibetan Mahayana Buddhism, there are six realms of existence, possible states into which humans can be reborn based on their accumulated karma. 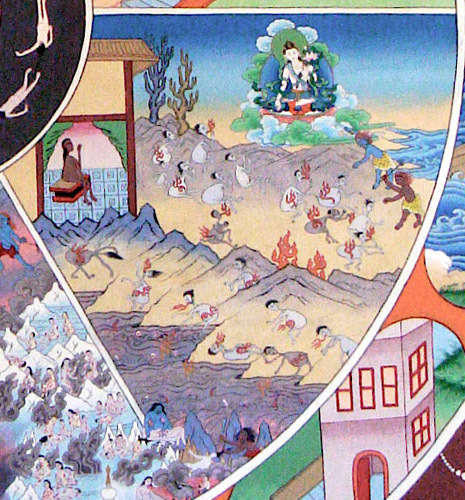 As depicted on the Bhava-cakra, or Wheel of Life, they are those of the Gods (Deva-gati), Demigods (Asura-gati), Humans (Manusya-gati), Animals (Tiryagyoni-gati), Hungry Ghosts (Preta-gati), and Hell (Naraka-gati). China’s annual Ghost, or Hungry Ghost, Festival honors the hungry ancestor ghosts, who on that one day of the year can emerge from their hell and visit the living. Incense is burned, music performed, and food and drink laid out for them. After the festival, water lanterns are lit and set afloat to help guide the ghosts back to the underworld. Similar festivals, typically held during summer and sometimes spread out over as much as a month, turn up in Japan, Vietnam, Taiwan, Singapore and Malaysia. A Hungry Ghost is always looking outside of itself – for something, anything, to satisfy its cravings. Unfortunately, many of us are already living the life of the Hungry Ghosts, as we try to fulfill our ultimately illusory desires. Relentless consumerism is one manifestation of this. Possessiveness and obsession are others. Longing for that which we cannot have is another. Do we actually think that this magical something or someone – whether we actually attain it or whether it is beyond our reach – will bring us the happiness we so desperately crave? This entry was posted in Art, History, Religion. Bookmark the permalink.